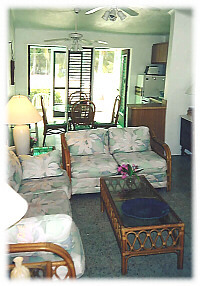 Enjoy seaside living at Cayman Kai, North Side. Take in the white sandy beach, clear turquoise water and relaxed atmosphere of this delightful getaway. Unparalleled diving and snorkeling are possible just steps from your door. Or you can simply laze in the sun, take a long beach walk, or float in the calm, reef-protected water. This island condo, with warm ocean breezes and stunning views of the sea is for those seeking a quiet, secluded, restorative experience. 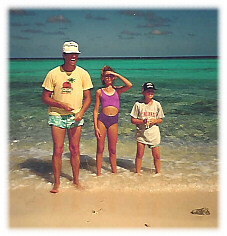 North Side of Grand Cayman, one of the world's premier diving locations. Other renowned dive spots of Little Cayman and Cayman Brac are short flights away. Cayman Kai is secluded and quiet yet Seven Mile Beach, the Hyatt Britannica golf course, and Georgetown duty free shopping are easily accessible by car or ferry. 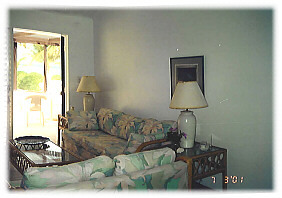 King size bedroom is spacious and airy, opening to a large screened porch. Queen sofa in living room easily converts to sleeper. Full service for 8 is provided, along with plentiful cookware. Coffee maker and toaster oven are also available. Spacious, open design, high ceilings and circulating fans. Clean, island decor with bamboo furnishings and terrazzo tiled floors. 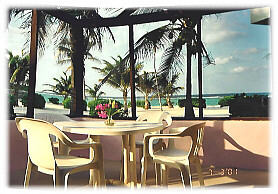 The Sea Lodges of Cayman Kai have off-street parking. Two new tennis courts are free and within walking distance. A dive shop and fishing trips are also available nearby. Guests have unlimited, free local telephone calling. Beach towels and linens are provided, and maid service is also available for a fee. Sip a cocktail and watch the beautiful sunset, or enjoy dining in one of the elegant island restaurants at North Side, just minutes from your door. Rates are for 1-2 persons. Additional guests are $15 /night.